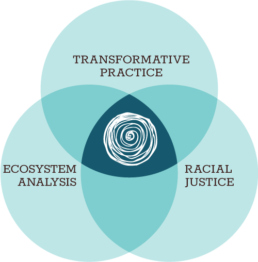 TLC is at the intersection of three core principles: transformative practice, ecosystem analysis, and racial justice believing that the interplay will holistically build leaders’ individual capacity while also over time move these concepts into the core of Colorado’s social justice framework. These principles influence the framing of TLC as a fellowship – not a leadership development program. Strong leaders of color are here and already working in the landscape. The fellowship will raise their profile and build their network of powerful peers, funders, and political actors. Transformative leadership takes into account the whole person in the system they inhabit, premised on the concept that a level of personal transformation and self-understanding is required to effectively fight for a parallel transformation in the world. No one leader needs the same thing, but TLC will offer curriculum around concepts like owning one’s power, creating sustainable modes of working, undoing internalized oppression, and incorporating embodied practice that moves from a focus on the head only to one that includes the heart and the wisdom of the body. Importantly, transformative leadership programs are becoming more common in places like the Bay Area and New York, but few exist away from the coasts. Research on modern leadership development programs shows that our (white-male dominant) culture favors an “individual heroic” model that sees a person as inherently gifted, merited, talented, rather than seeing a leader as an amalgamation of the opportunities and privileges afforded to someone over the course of her life. Leaders who practice more collective leadership styles can be rendered invisible – they are told they are not being “leader-like”. Because TLC is being designed by and for people of color, with a strong gender lens, it can break from white-male normative models and instead lift up culturally relevant concepts of community and networked leadership. TLC will incorporate curriculum that helps leaders identify these barriers and experiment with different approaches. The way grassroots organizations are funded, including a severe lack of general operating support – the “I believe in you” money – was identified as a prime barrier to success. TLC will intentionally engage funders in dialogue and community to consider new relational approaches that change funder-grantee dynamics. Build relationships of trust & understanding among leaders that can endure outside the program, withstand losses, external pressure & conflict. Understand that in order for the progressive community to successfully advance our goals we must focus first on supporting leaders of color & organizing within communities of color. Believe that all leaders and funders must respond to the call of people of color leaders in order to create an ecosystem that values & supports their authentic leadership and the organizations they build. Seek to center the experiences and needs of leaders of color throughout our efforts. Focus on our shared fate and common purpose and avoid an “us versus them” mentality. Be transparent & honest about dynamics of race, power and privilege and explore together how we can both navigate and change the dynamics that undermine our shared success. Build a supportive & safe space where leaders can share, learn and grow. Balance our needs as individual leaders, as organizational leaders, and as movement leaders. Identifying challenges in the ecosystem and actively exploring possible solutions. We seek to leverage resources and investments that support the development and sustainability of Colorado’s progressive leadership, especially among people of color leaders. We will co-create this program with leaders directly participating in the program itself. Supporting leaders in key positions, and developing the pipeline of leaders who can grow into executive or senior leadership roles into the future.